Join the discussion on our forums! 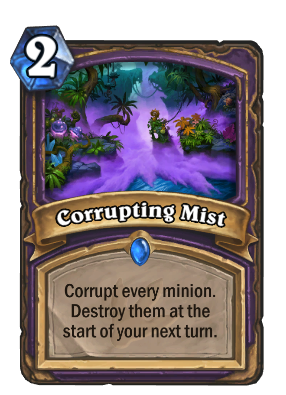 Come discuss Corrupting Mist over in our dedicated Corrupting Mist discussion topic. if only you could stealth Flesheating Ghoul. Im typically not sassy, but you obviously don't know how stealth works. Stealth allows friendly minions to not be targetable by enemy minions or spells, and enemy stealth minions to do vice versa. Stealth has never worked against board clears/effects and AoE spells, so there is no reason that it would now. Frankly, your idea wouldn't even be wouldn't even be valid if you were using the whole Can't be targeted by Hero Powers or spells argument because cards like those can still die to board clears and AoE spells. 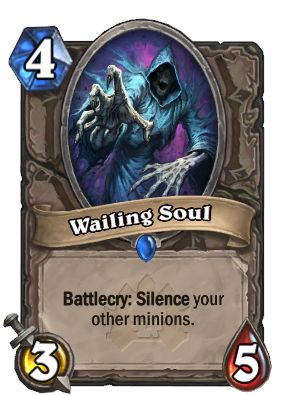 Not even using silence would work because it would cause all of the card text on the Flesheating Ghoul to be exactly Null, so you would effectively be protecting a 2/3 minion from a makeshift Twisting Nether. Starts Your turn: play Corrupting Mist then play Flesheating Ghoul then play something like Finicky Cloakfield on your Flesheating Ghoul then pray for no AoE spells. Because you are right. One good removal card which is pretty standard in a good deck would clear this stealth problem with ease. I am not saying this card is top tier. I am saying that there could be a deck that is built around weird combos for the heck of it. Just like people play Majordomo Executus combos. Very good card in the right meta. For example, if we had it now, it would make dragon priest early game or strong shaman openers a joke for warlock. This isn't supposed to be a late game clear. Not really, the true strength behind doomsayer isn't that it's going to kill whats currently on the board, it's that it prevents the other player from placing anything new on the board so they are forced to skip the turn and give the tempo lead back to the doomsayer player. [Wild] Kill Dragon Priest openers of Wyrmrest Agent, Twilight Guardian, cards buffed by Kabal Talonpriest, and other annoying high-health minions. The beauty of the card is that it can cleanly deal with sticky minions for cheap while giving you options to deal with late-game boards also. I like it. This is better than Doomsayer for control warlock. If opponent who plays aggro kills doomsayer it pretty much means you lost. This guarantees a early agression board clear, which is much more important than 2 mana 7 heal. Too many expansions too late. Should have come out in TGT with dreadsteeds.